Tropical Depression 24W formed on Oct. 12 and continued to move west toward the Philippines on Oct. 13, 2016. 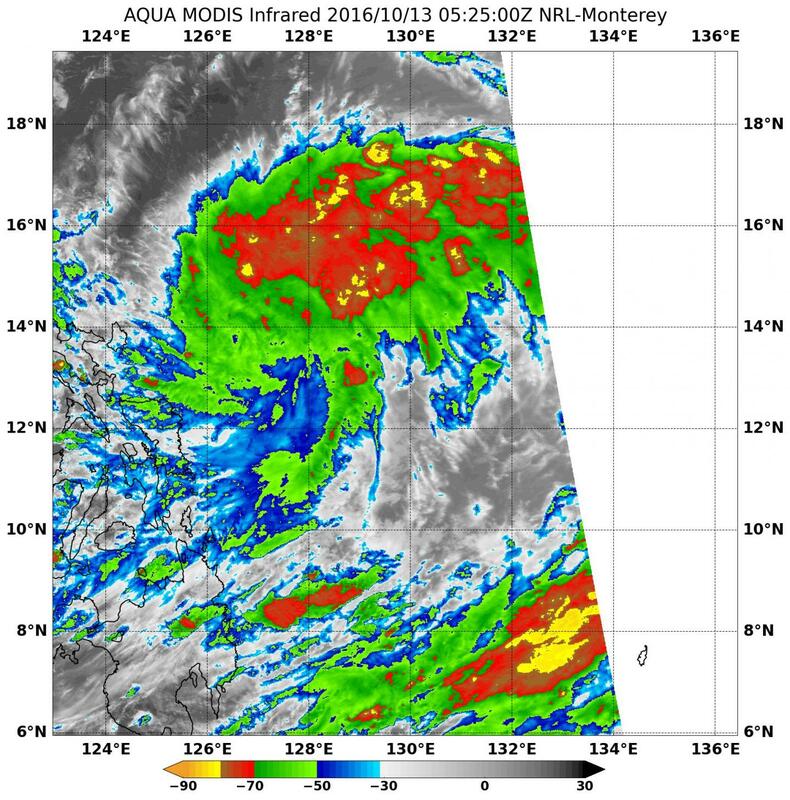 On Oct. 13 at 1:25 a.m. EDT (0525 UTC), NASA's Aqua satellite passed over 24W and analyzed the storm in infrared light to show temperatures. The MODIS or Moderate Resolution Imaging Spectroradiometer instrument aboard NASA's Aqua satellite revealed cloud top temperatures north of the center as cold or colder than minus 70 degrees Fahrenheit (minus 56.6 degrees Celsius). NASA research indicates very cold cloud tops with the potential to generate very heavy rainfall. At 5 a.m. EDT (0900 UTC) Tropical depression 24W, known in the Philippines as Karen was located near 13.3 degrees north latitude and 129.4 degrees east longitude. That's about 495 miles east of Manila, Philippines. 24W was moving to the northwest at 6 knots (7 mph/11 kph) and had maximum sustained winds near 30 knots (34.5 mph/55.5 kph). 24W is forecast to strengthen into a typhoon according to the Joint Typhoon Warning Center. It is then expected to make landfall in eastern Luzon, the northern Philippines late on Oct. 15 or early on Oct. 16.